Consistent with the Gospel accounts of the death of Jesus and the independent testimonies of the Talmud, Josephus, Tactitus, and early ante-Nicean fathers of the Christian Church, the final moments of the life of Jesus were surrounded with cataclysmic events and fateful portents. These portents shadowed the esteemed high priest’s family, the House of Ananus and the temple hierarchy all the way to the final destruction of that glorious temple in Jerusalem in 70 CE. Stamped it into the psychic of the Jewish people, these same cataclysmic events will be replayed at the time of the end before the restoration of Israel is completed by the return of Jesus in the clouds of glory as the Moshiach Yahshua ben David (Messiah Jesus son of David). Let us look how the natural world was rent and torn while the agony of the Suffering Servant was demonstrated on that cross before the Jewish people. We must understand again that the death of Jesus was not a human event but a cosmic event. The Book of Job gives us a heavenly scene where in the Council of heaven the ‘sons of God’ met and deliberate. It was here in this council that Satan went to represent this earth. How so? There in the Garden, when Adam chose to disobey God, Satan wrestled away from ‘this’ son of God his dominion as ruler of this planet and his role to sit in that cosmic council in heaven. There Satan known as HaSatan the Accuser has been representing this planet before the throne of God. It was not just the followers of Jesus, the rulers of the temple and the Roman soldiers that watched the unfolding of this great “Drama of the Ages”. The other dimensional hosts in the universe; the sons of God representing other planets and galaxies and the angelic hosts all watched with bated breath and horror as the Son of God gave up His life. Why did Jesus do this mysterious act? He did it so that all mankind, like that ‘one lost sheep’ (Matthew 18:12) would have the privilege to be restored to their multi-dimensional and glorified bodies and redeemed as descendants of Adam to their royal birth as “sons of the Loving God” (Hosea 1:10). Here, with the cross bar hanging on the tree, the Only Begotten Son of His Father suffered the oppressive agony of mind, soul and body. It is important to see the graphic reality that the death of Yahshua had, not only upon the woman and the believers of Jerusalem, but to grasp the reality of the impact of Jesus’ death upon all creation. The angelic hosts bowed their heads in shame and sorrow as they watched first the prophet of Israel addressing the daughters of Jerusalem of their impending and future sorrow. There they saw him as the future high priest and tzaddik, an advocate for His people as Yahshua plead with His Abba (Father) to forgive His murderers of their deeds. As a son of Man, He tenderly sought to provide a guardian for his mother Mary to protect and shelter her through her grief and sorrow. They also saw Him as a loving Savior who through Him forgiveness would be given not only for the sins of a sorrowful and repentant thief but for the sins of all mankind throughout the ages. At the sixth hour (noon), the earth bowed its head in sorrow as this planet tilted on its axis and the sun with its radiant sunshine swiftly moved down below the horizon. A deathly pallor hung over Jerusalem and hovered over the body of Yahshua. It was as if the sun refused to look upon the Son of God and all the inanimate natural world went into convulsions. Even the atoms seemed to be paralyzed in the presence of Cosmic death. This was not a solar eclipse as when the moon, the lesser light passes in front of its source of nighttime brilliance. The Passover was an evening in which the moon is full and on the opposite side of the earth from the sun. Let us look at the Matthew’s account of God’s technical sound and light effects associated with the earthquake at Christ’s final moments. Some of those who stood there, when they heard that, said, “This Man is calling for Elijah!” Immediately on of them ran and took a sponge, filled it with sour wine and put it on a reed, and offered it to Him to drink. “And Jesus cried out again with a loud voice, and yielded up His spirit. Then, behold, the veil of the temple was torn in two from top to bottom; and the earth quaked, and the rocks were split, and the graves were opened; and many bodies of the saints who had fallen asleep were raised; and coming out of the graves after His resurrection, they went into the holy city and appeared to many. In the denseness of what appeared to be a moonless foggy night an Act of God occurring in the midst of the daytime gave testimony that in the impenetrable darkness. God’s presence was to be hidden from His Son. Even as the Father drew close to His Son and with the presence of the holy archangels of His emanations, the presence of the Almighty One, the hidden Ein Sof, was not to be revealed. For God to allow His presence to flash forth, all humans and all nature would have been destroyed. Yet even in the impenetrable dense darkness, the Son walked His pathway of sorrow alone. The throngs around the crucifixion site were silent in terror. The penitent followers of Yahshua fell to the ground crushed and in abject sorrow. Within the temple, Caiphas, high priest, was in the midst of preparing to slay the Pesach lamb. The Sanhedrin rulers and chief elders who supported the evil act of Caiphas and his father Ananus cowered in fear around the boulders and mountain crags with curses and reviling taunts. The tallit (mantle) of the Father covered His Son as Yahshua walked the wine press alone, all alone. Then the earth awakened to a new day, as the sun arose from the western sky as though it was out of its normal coarse and pathway through the heavens. With the spirit of Yahshua revived, he once again felt His own physical suffering. The cosmic separation from His Father passed and He looked for something to quench His thirst. A Roman soldier in a moment of pity took a sponge dipped in vinegar, put it on a stalk of hyssop and offered it to Jesus. The temple rulers, who moments before thought that in their own tribulation the end had come, went back to mocking Jesus. Then the Lamb of God, who was pronounced without blemish in His interrogation in the temple and found without fault by the Roman Procurator, Pontius Pilate, now with His flesh gouged and ripped by the floggings and beatings cast His eyes swollen with tears as it tenderly swept over the crowds. His hands who fingers brought healing and life to so many had blood dripping down across the wrists, His feet who walked from village to village bringing the Good News of salvation from His Father now had huge spikes agonizingly separating bones from tendons in the ankles, and the blood dripping down over his brow from the crown of thorns. Then His body went limp after crying aloud, “It is Finished”. The stories of the crucifixion as with all scripture are brief, cryptic and loaded with literal, mystical and prophetic messages. Some scholars see the crucifixion of Jesus as an event, others see it as a fulfillment of a Divine plan, and even others see it as a portrayal or mini-drama of the future finale of the Drama of the Ages before the next era when the Moshiach (Messiah) returns to dwell among men (Succot). At one moment in planetary time, the supernatural intersected with the natural. Oh, yes the tectonic plates beneath the substructure of the City of David had in the past experienced earthquakes and tremors in the subterranean structure of Mount Moriah, Mount Zion and the Mount of Olives. Never before in recorded history did the earthquakes with precision open the tombs of the dead built along base of the Mount of Olives. Here in the Valley of Jehoshaphat were the most revered sites of the holy ones of Israel who wished that their remains would be located on the eastern slopes of the Mount of Olives. 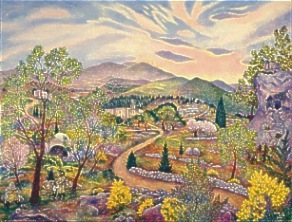 It was their desire that when they were resurrected they could visualize the coming of the Moschiach (Messiah) from the sides of the Mount of Olives as foretold by the prophets of old as He arrived coming on a celestial journey along the King’s Highway’s towards the revered site of the holy temple of Solomon. Here with the resurrection of Yahshua, we also see a special resurrection, for the gospels state, “and coming out of the graves after His resurrection, they went into the holy city and appeared to many.” (Matthew 27:53) The tombs were raised by the tectonic uplift out of the earth yet the sleeping saints did not come out of the graves until they were called by their Lord and Master that they had worshipped in past ages in faith. The cataclysms surrounding the death of Jesus were only a backdrop to the drama that was being portrayed on Calvary. As the cycles of exile and redemption were portrayed over and over in the Holy Script, so also these cataclysms are a prophetic shadow picture of the return of the Moshiach (Messiah) in the clouds of glory and the catastrophic event that will proceed that glorious moment. This earthquake was also the beginning of omens that would haunt the high priests of Judea as they knew that their world along with their temple was about to end. Let us read the words of Alfred Edersheim in his book, The Life and Times of Jesus the Messiah. Alfred Edersheim - "And now a shudder ran through Nature, as its Sun had set. We dare not do more than follow the rapid outlines of the Evangelistic narrative. As the first token, it records the rending of the Temple-Veil in two from the top downward to the bottom; as the second, the quaking of the earth, the rending of the rocks and the opening of the graves . . . while the rending of the Veil is recorded first, as being the most significant token to Israel, it may have been connected with the earthquake, although this alone might scarcely account for the tearing of so heavy a Veil from the top to the bottom. Even the latter circumstance has its significance. That some great catastrophe, betokening the impending destruction of the Temple, had occurred in the Sanctuary about this very time, is confirmed by not less than four mutually independent testimonies: those of Tacitus, of Josephus, of the Talmud, and of earliest Christian tradition. The most important of these are, of course, the Talmud and Josephus. The latter speaks of the mysterious extinction of the middle and chief light in the Golden Candlestick, forty years before the destruction of the Temple; and both he and the Talmud refer to a supernatural opening by themselves of the great Temple-gates that had been previously closed, which was regarded as a portent of the coming destruction of the Temple" (Alfred Edersheim, The Life and Times of Jesus the Messiah, p.610). Let us look first at the temple veil between the Holy Place and the Holy of Holiest. The sacred veil or curtain called the peroketh represented an inter-dimensional veil that shielded the Unseen, Unfathomable Lord of hosts from the rest of His creation. In the Torah, it was described as a “veil of blue, and purple, and scarlet, and fine twined linen of cunning work” which separated the Holy of Holiest, the Kodesh Hakadashim, from the rest of the Temple. The veil was then hung on four pillars like the Throne of God which rested on the four cherubim in heaven. Exodus 26:31 - “You shall make a veil woven of blue, purple, and scarlet thread, and fine woven linen. It shall be woven with an artistic design of cherubim. You shall hang it upon the four pillars of acacia wood overlaid with gold. Their hooks shall be gold, upon four sockets of silver. And you shall hang the veil from the clasps. According to rabbinic sources, the Sacred Veil that was made for the Temple of Solomon was actually made by layering multiple sheets of colored linen together. The curtain thickness was said to be over three feet thick. On the highest and most holy of days in the life of a Hebrew, the Day of Atonement, the Lord of hosts left His throne of justice and moved to the seat of mercy to meet with the Tzaddik of Israel, the High Priest as he entered the Most Holy Place. One can only imagine the high priest blindly navigating through the maze of thirty layers of linen sheet with the censor with smoking incense in one hand and the blood of the ram in the bowl in the other hand. As his world became darker and darker, he soon found himself standing in the presence of the Lord in complete darkness. Without any sensory sight to help him, standing in the presence of the Lord would have been very disorientating. He had to lean on faith and trust explicitly on the Lord to shield and protect him, for to touch the ark of the Lord would mean instant death. This was very much like the spiritual maze of the mystic whose mind ascends mentally to the throne of the Lord or the pathway of the saint asking for guidance of the Lord every moment of his life, every step of interaction with friends, business associates, family and his spouse. Then the Lord promised the high priest, “I will appear in the cloud above the mercy seat”. Though this event was in the midst of a great earthquake the portents to the high priest and the Sanhedrin occurring at the moment of the death of Yahshua were ominous. Even with the collapse of the lintel, the huge curtain would have fallen to the ground, but the historical testimony states that “the veil of the temple was torn in two from top to bottom”. (Matthew 27:51) The unseen Hand of the Almighty One sent a message to Caiphas, Ananus and all the other temple rulers. This message was no less ominous than the Finger of the Lord writing on the walls of the banquet hall of Belshazzar. The judgments of God, as portrayed over the preceding three hours as Jesus hung on the cross, would be visited upon His own temple, His own people, and upon the evil followers of the temple rulers. Yet the rending of the veil is recorded in the gospels as if it were observed from the site of the execution of Jesus. The only place in the vicinity of the Temple of Herod that had a visual view of the Eastern Gate looking down upon the temple with a view of the veil in front of the Holy of Holiest was on the western slopes of the Mount of Olives near the Miphkad Altar where the ashes of the red heifer were burnt. The strangest and unexplained phenomenon of Talmudic history before the fall of Jerusalem are the hints of the portents and omens that were directed at the temple, the sacrificial system in the temple and the temple rulers. The Talmud makes a clear distinction that forty years before the destruction of the temple of Herod in 70 CE, the sacred rituals of the temple of the Lord were no longer acceptable to their God. Do their dates hold a secret clue to an event that was significant yet remained unstated that implicated a breech in the relationship between the high priest, the temple priests and the Lord of hosts? Is it also not fascinating that the Sabbatical Years of 26 and 33 CE were part of the highest and most holy years of Jewish life; the land laid fallow at rest, and the people were to study the Torah and follow the their rabbi for spiritual feeding all year? Is it not equally a coincidence that if Yahshua was born at Succot at 7 CE and was two years old at the last year of Herod’s life just before he died at 4 CE when all the young males two and under were massacred in Bethlehem? Jesus then was 12 years at the eve of His Bar Mitzvoth (second birth) at 6 CE when he was questioned by the newly inaugurated high priest, Ananus, the father-in-law of Caiphas and the Sanhedrin (chief elders) at Passover. Then in the Sabbatical Year starting at Rosh Hashanah 26 CE, Jesus began His ministry in Galilee for the “Lost Sheep of the House of Israel”. Then after three and one-half years, in the ‘midst of the (Sabbatical) week” (26 CE to 33 CE) and in the “midst” of the Sabbatical Year at Passover in 30 CE, His life, the absolute fulfillment of Torah and the Spring Festivals of the Lord, was ‘cut off” at the age of forty. Do we not see hints of a fulfillment of the prophecy of the Prophet Daniel? By all appearances the timing of the Lord of hosts was perfect. The Son of God as the Torah in the flesh was forty years old. His death started another forty years of omens and portents before the final destruction of the temple and the city of Jerusalem. Here in one event in history, Yahshua fulfilled the legal requirements of three ‘sin offerings’ as given by the Lord of hosts at Sinai; the sacrifice of the “sin offering” of the Pesach (Passover) Lamb, the fulfillment of the final and tenth red heifer as the ‘sin offering’ for the cleansing of the children of Israel and the fulfillment of the Sacrificial goat as a “sin offering” at Yom Kippur. Here type met anti-type in tripled fulfillment. The countdown to the effects of the last judgment of the full Sanhedrin in the Chamber of Hewn Stones had begun. There in the room were the seventy two august members of Jewish society; the high priest, Caiphas and his father, Ananus the Elder, selected Sadducees, Pharisees and Chief Elders of Israel. When Jesus was condemned by the full Sanhedrin, he was standing in the Chamber of Hewn Stones within the temple precinct as they condemned Him to death for blasphemy. Jesus had just been interned in the courtyard of the high priest since the middle of the night. There He was ‘mocked’, ‘beat’, blindfolded’, ‘struck’ and ‘blasphemously spoke against’ and then…. Here on the northeast corner of the temple proper, about forty yards from the entrance to the Holy Place was the chamber of the Supreme Court called the Sanhedrin. It was the council room called the Lishkat Hagazit, the Chamber of Hewn Stones. The Chamber was a highly vaulted ceiling room fit for the respect of the Court of Justice with its highly polished hewn limestone. Directly behind the Chamber of Hewn Stones was the Lishkat Parhedrin, the private Chamber of the High Priest (Kohen Gadol). It was here that the high priest would stay when he left his mansion and go to his private residence in the temple. It was there that Caiphas would leave his residence on the Preparation Day of the Feast of Unleavened Bread, the 14th day of Nissan and enter the sanctity of the temple of the Lord. For the next seven days starting on the eve of the Pesach (Passover), the 15th day of Nissan, Caiphas would live on the premise of the temple where he would remain ritually clean and pure. Rabbi Leibel Reznick - “The Talmud tells us that when the Sanhedrin (Supreme Court) ceased to judge capital offenses, they moved from the Supreme Court chambers (Chamber of Hewn Stones) to the 'shopping mall' (Rosh Hashanah 31a). This shopping mall was located on the Temple Mount (Rashi) . . . Perhaps this shopping mall was located within the Royal Basilica. Because this area was built on Herod's extension, it did not have the sanctity of the Temple itself, and commerce would have been permitted" (Rabbi Leibel Reznick, The Holy Temple Revisited, Jason Aronson, Inc., Northvale, New Jersey, 1993, p.69). This same year, 30 A.D, we can presume that the Sanhedrin had to abandon the Chamber of Hewn Stones, not because they wanted to but because the Hand of the Lord forced them to relocate. This chamber was near the Holy Place in the Temple, which was its official seat or location. Only about 40 yards to the southwest was the temple proper and the Holy Place. Many will state that the temple did not receive any structural damage during the earthquake during the death of Christ. Yet, the Sanhedrin was making a sudden move from the place of its deliberations in the gorgeous facility of the Supreme Court to a less esteemed and revered location, called "The Trading Place". This suggests that the Chamber of Hewn Stones was unfit for deliberations because of the earthquake and the temple itself may also have received more severe structural damage as we shall see later. We receive another hint in Josephus, Wars of the Jews, that the Sanhedrin moved their ‘council house’ to a more secure place in the days prior to the siege of Jerusalem by Rome. Ernest Martin Ph.D. - "If an earthquake of the magnitude capable of breaking the stone lintel at the top of the entrance to the Holy Place was occurring at the exact time of Christ's death, then what would such an earthquake have done to the Chamber of Hewn Stones (a vaulted and columned structure) no more than 40 yards away from where the stone lintel fell and the curtain torn in two? "There is every reason to believe, though the evidence is circumstantial, that the Chamber of Hewn Stones was so damaged in the same earthquake that it became structurally unsafe from that time forward. Something like this had to have happened because the Sanhedrin would not have left this majestic chamber (to take up residence in the insignificant 'Trading Place') unless something approaching this explanation took place"
"If this is actually what happened (and I have no doubt that it did), we then have a most remarkable witness that God the Father engineered every action happening on the day of Christ's trial and crucifixion. It means that the judgment made by the official Sanhedrin against Jesus within the Chamber of Hewn Stones, was THE LAST JUDGMENT ever given by the official Sanhedrin in their majestic chambers within the Temple! It would show that God the Father demonstrated by the earthquake at Christ's death that the sentence of the Sanhedrin against Jesus would be the last judgment it would ever make in that authorized place!" (Earnest Martin Ph.D. Secret of Golgotha, p.230-231). · the huge brass doors of the Hekel that took over twenty men to close, kept mysteriously opening on its own. What were these omens and the meaning to the temple and the Jewish People? Let the rabbis tell the story in their own way. Yoma 39b - “Our rabbis taught: During the last forty years before the destruction of the Temple, the lot (‘For the Lord’) did not come up in the right hand; nor did the crimson colored strap become white; nor did the western most light shine; and the doors of the Hekel would open by themselves until Rabbi Yohanan B. Zakkai rebuked them [the gates] saying, Hekel, Hekel, why alarmist thou us? We know that thou art destined to be destroyed." During the awesome ceremonies of Yom Kippur, the Day of Judgment, the high priest first took off his royal robe called the “Golden Garment” and put on a linen robe that he used to officiate during Yom Kippur. Here the Tzaddik (Righteous one) of Israel mediated for his people in the Holy of holiest before the mercy seat of God over the Ark of the Covenant. After the high priest sacrificed a young bullock for himself and his family, he turned to the two young spotless goats. There besides the altar was a golden urn in which inside were two golden tablets; one was engraved “For the Lord” and the other was engraved “For Azazel” which meant, “For the people.” Which ever tablet was pulled out first with the right hand of the priest would determined the fate of the Sacrificial goat. The left hand would pull out the golden tablet which would determine the fate of the scapegoat. Earlier traditions state that within the receptacle in the Holy Place were placed two stones, one stone white representing “For the Lord” and the second stone back representing “For Azazel” or “For the People”. The blood from this goat that was chosen ‘For the Lord” would be taken behind the temple veil and sprinkled over the mercy seat on the Ark of the Covenant for sins of the people. Afterwards the ‘golden tablet’ was placed upon the head of the other goat, Azazel, and the sins of the congregation were pronounced. This goat was then taken to the wilderness with a red cord around its neck, cast off a cliff or into a pit, where it would die. For forty years, the first omen occurred at Yom Kippur when the high priest year after year pulled out the golden tablet ‘For the people’ with his right hand. It was the belief of the Jews that if the high priest pulled out first the tablet, “For the Lord” in his right hand, the Lord of hosts was looking favorably upon them. If the high priest pulled out the golden tablet engraved “For Azazel (the people)” first in his right hand and the golden tablet, “For the Lord” was pulled out with the left hand, then severe judgments were to be pronounced upon the people and that their temple would be destroyed. The ‘goats’ were not cast aside because they believed the wrong creed, spoke the Name of the Lord with the wrong syllables, worshipped the Lord with the wrong rituals, or excommunicate people from their churches because they did not conform or affirm certain creeds of the church. No, they were cast out because they were not ‘just” or tzaddiks. They did not feed the hungry, give water to the thirsty, shelter the stranger, clothe the naked or visit the imprisoned. Jesus is looking for a people who will follow Him and become a tzaddik or righteous person like him. Was it not the prophet Zechariah who wrote the Oracles of the Lord to the Jews that at the time of the end, the Jews must replace rituals with obedience? Zechariah 7:9-10 – “Execute true justice, show mercy and compassion everyone to his brother. Do not oppress the widow or the fatherless, the alien or the poor. Let none of you plan evil in his heart against his brother. The second omen that occurred at 30 CE at the death of Yahshua was that the “crimson red cord would not turn white” after the Day of Atonement. Returning to the scene in the temple in preparation for the Day of Atonement, the high priest in the temple of Herod took the two goats and then the two golden tablets were drawn from the golden urn. These tablets were placed on the heads of each goat and their fate was sealed. The sacrificial goat was taken away and slain and its blood was sprinkled over the foundation stone which jutted through the middle of the Holy of Holiest where the Ark of the Covenant once rested. The scapegoat, on whose head was placed the golden tablet which said “For Azazel (for the people) was placed; a red sash or red cord was tied to its horn. After the blood of the sacrificial goat was taken into the Most Holy Place and sprinkled on the Foundation Stone, the high priest appointed a special Levite handler who took off the red sash or cord off the horn, tore it in half, and then retied one half of the cord back onto the horn of the goat. The other half of the red cord was tied to the door post of the temple. The crowds of pilgrims would crowd outside the temple door called the Hekel. Meanwhile priest assigned by lot to be the goat handler along with relay runners were to rush and take the scapegoat to the wilderness. They could imagine the scapegoat carrying away the sins of the people of Judea. Yet every year for forty years, hush was upon the throngs of people. Every year the golden tablet “For the people” was selected by the right hand of the high priest. Every year they anticipated the judgments of the Lord. Yet, they had one more redemption, the red cord hanging on the door of the Hekel. Maybe this year, this red cord dipped in the blood of the Sacrificial goat would turn white. Maybe this year the Lord of hosts would accept their offering and redeem them to His favor. 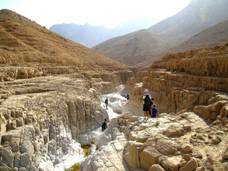 The ravines at Nahal Mishmar between Masada and En Gedi . One half of the red cord was tied to the dying goat that plunged to its death over the ravine, the over half of the red cord was tied to the front door post of the great Hekel of the Most Holy Place. Then a supernatural event happened. Year after year for over a hundred years, the red cord turned white and the people rejoiced throughout the land. With the goat now dead in a land with no inhabitances, the Lord of hosts had atoned for their sins and accepted their sacrifice. Yet between the year of 30 CE and 70 CE, for forty years, the red cord never turned white. Their sacrifice was not accepted by the Lord of hosts. The omens of a future destruction of their temple and their sacrifice not being accepted by the Lord of hosts weighed heavily upon their hearts. The third omen that started at 30 CE after the death of Jesus was “the western most light” refused to shine or send forth any light. What was the western most lamp and what was its significance? Daily the Great Menorah in the temple was cleaned in the morning by the priests. Standing about six feet in height, according to Talmis iii, 9; Yoma 33a, the four almond shaped lamps towards the western side of the menorah (towards the veil and the Holy of Holiest) were cleaned and relit and after the morning sacrifice the two almond shaped lamps to the eastern side of the temple were cleaned and relit. The seventh or central lamp stand, called the Ner-ha-Ma’arabi was called the ‘Western Lamp”. This lamp remained lit all day and was cleaned and relit in the evening. It was the fire from this ‘Western Lamp’ that was used to relight all the other lamps while the menorah lamps were daily being cleaned. As such, it was called the Ner Elohim or the “Lamp of God”. According to Men. 89a, each lamp contained a bowl that held one-half log measure of oil which was the amount of oil that would fit in three eggs. This was enough oil to keep the lamp burning through the longest night of the year in mid winter. Yet the Ner Elohim would routinely burn through the next evening. Is it any wonder that the almond in Hebrew is lust, meaning light? There is a small but growing group of Biblical scholars who believe that Yahshua (Jesus) was crucified on a tree in which the crossbeam that He carried was lashed to the tree and there He hanged. Did not Peter who spoke of Jesus saying? Was it not the Apostle Paul who stated? Galatians 3:13 – “Christ has redeemed us from the curse of the law, having become a curse for us (for it is written, ‘Cursed is everyone who hangs on a tree’). Was it not the Torah who stated how a man, condemned to die was to be put to death. Is it any wonder also that many of these scholars believe that the tree was actually an almond tree. The textual study suggests that Aaron’s cane that was initially placed in the Ark of the Covenant, was taken out during the era of Solomon’s Temple after it miraculously flowered and rooted. This growing almond tree was planted on the Mount of Olives. About a thousand years later, Jesus, the “Light of the world”, was hung on this Almond tree, called the Tree of Light, which was near the Miphkad altar where the ashes of the Red Heifer were collected. Josephus - Moreover, the eastern gate of the inner, [court of the temple,] which was of brass, and vastly heavy, and had been with difficulty shut by twenty men, and rested upon a basis armed with iron, and had bolts fastened very deep into the firm floor, which was there made of one entire stone, was seen to be opened of its own accord about the sixth hour of the night. Notice the strength of these doors and the immense construction that went into erecting these two doors of bronze. It was erected over ‘one entire stone’ which appeared to be overlaid with iron and then bolts to anchor it when it was closed that penetrated deep into the stone and iron base. These omens and portents which haunted the House of Ananus for forty years, put fear into the life of the last high priest of the House of Ananus. It was during the reign of the last grandson of Ananus the Elder, Mattathias the son of Theophilus, when a new omen came over the temple of the Lord. The days of the House of Ananus appeared to be numbered. Sometime about 65-66 CE, just before the final collapse of Jewish resistance and the legions of Vespasian surrounded the city of Jerusalem, Josephus recorded the astral phenomenon which signaled to many serious portents of their future. The hierarchy of the temple priests became more and more aware that the sacrificial system within the temple was corrupt and not accepted in the eyes of the Lord of hosts. Historical evidence depicts that a non-animal sacrificial system was instituted at the temple by the Nazarenes. This “oppositional priesthood” occurred during this reign of James the Just and the Sanhedrin of the Hebrew Nazarene Ecclesia of Jerusalem. These evil portends continued to demonstrate themselves to the leadership of the Jews. According to the oral traditions of the Jews, the red heifer was one of the ‘sin offerings’ in the sacrificial services and used as a ‘purification offering’ for the congregation of Israel. There were nine red heifers that were sacrificed since the days of Aaron and Moses at Sinai up to the final destruction of the temple in 70 CE. According to traditions of the Talmud, a tenth heifer was to be sacrificed in preparation for the final temple at the time of the end in preparation for the coming of the Moshiach (messiah). Feeling corruption all around, the priests and temple leadership tried to force the hand of HaShem, the God of Abraham to save His temple and bring salvation to His people. Flavius Josephus recounts the scene of the high priest making a desperate attempt to prepare a red heifer to be slaughtered for the purification of the temple while the walls of the city were being surrounded by the forces of Vespasian. Was the Almighty Father telling the temple rulers and chief priests that He had the right to change the laws of nature and that their tenth red heifer had already been sacrificed as a ‘sin offering’ in 30 CE, when the House of Ananus had His only Begotten Son, Yahshua ben Yosef, executed on the Almond Tree on the Mount of Olives as the real Pesach Lamb, the Sacrificial Goat and the Red Heifer?